It was a challenge to design our online Dogsafe Canine First Aid eLearning programs that would maintain our high standards in canine first aid education -- but we did it! "I really enjoyed the eLearning program you have created. The ability to leave and return to the program was very useful and gave me a chance to think about the information." Our signature course is designed to teach dog owners and dog professionals the knowledge and skills to respond to any sick or injured dog. Customize your eLearning with books, DVDs or digital add-ons. Our one-of-a-kind workshop trains you how to respond as a lost dog investigator. You'll make effective flyers and posters and more. Customize your eLearning with books, DVDs or digital add-ons. Our most basic workshop is designed for busy dog owners who are looking for "need to know" topics such as prevention, vital signs, three health tests, head-to-tail assessments and more. The Dogsafe eLearning program was great! Thanks for all the feedback, you certainly go to a lot of trouble ensuring your pupils have an excellent understanding of what they are doing and why. 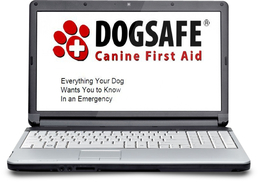 I am very impressed by the education, feedback and depth of the Dogsafe eLearning course and recommend it frequently. unlimited phone or email support during your course -- we're here for you! What You'll Need ...not much! and don't worry, we've got unlimited phone or email support for any technical questions ... we're here for you! I really want to thank you for the Dogsafe 101 eLearning course. I think people are going to benefit greatly from it. Got a Whole Team Needing Certification? Save on registrations when you buy bulk Dogsafe eLearning course credits. Great for registering a whole team now or save for the future when new staff join your company. We chose Dogsafe as our Canine First Aid/CPR provider and have been very pleased with the content, ease of use, and support that we have received throughout the process. The Dogsafe 101 eLearning program has been easy to access and use for all 350 of our employees nationwide, and has provided us with a knowledge of pet health which allows us to be considered one of the best teams in the pet care industry.